On February 14th, we take a day to celebrate love and romance and affection for those special people in our lives. But what about the animals in our lives? Here are some suggestions of ways to show animals some extra love for Valentine’s Day. Grooming: Just like humans, animals can get a lot of joy from some proper pampering. Even if it’s not in your budget to send Rufus T. Barkington to the spa, there are simple things you can do at home to keep him looking and feeling great. Trimming nails, brushing teeth, and combing fur keeps your cats and dogs happy and healthy, and can be a great bonding experience. Remember to be gentle and take your time. No one wants a rushed pedicure! Gifts: Companion animals love new toys—and cats love the boxes they come in—so think about picking up a couple additions to their toy chest. Sometimes a fresh squeak from a ball or the jingle of a bell can bring out the puppy in our old friends. Search reviews online or journey to your local pet supply store and ask the experts what they recommend. They usually have great suggestions on what will entice and delight your companion. Special food: Animals need to eat food just like the rest of us, but that doesn’t mean it needs to be boring and routine! While it’s best to avoid feeding them food generally reserved for humans, adding some veterinarian approved treats to their meal time is sure to spice up their life and remind them how much you care. Once again, ask your local retailer for recommendations or, if possible, take your furry friend shopping with you! Odds are good their nose will tell you exactly what would make them happiest. Clean spaces: Sure, our friends can be messy, smelly, chaotic tornados. There’s no need to use that as an excuse for dirty bedding and dust-bunny filled hiding spaces. Take a vacuum to your friend’s favorite chair, sweep the dirt out of Fluffy’s favorite windowsill, and launder their snuggle blanket. Be sure to avoid cleaning with any fragrant-heavy solutions, as their strong senses may be overpowered and they’ll go in search of a new place to make a bed. If you have the funds, a new dog bed or cat tree can bring variety to their spatial routine. If your feline companions are upwardly mobile, something as simple as a box and a towel on top of the refrigerator offers a new vantage point for them to enjoy. Of course, we can show love to animals who we don’t even know personally, who still provide us with happiness year round. Consider putting out a new feeder, house, or bath for your winged friends (and perhaps the furry tree-dwellers like squirrels and chipmunks). Making your yard a safe perch for the locals can brighten their day, as well as yours! You can also choose to make a donation or, if you’re a hands-on animal lover, donate your time to local animal organizations, such as shelters, rescues, farm sanctuaries, or get involved with animal rights organizations like the Animal Rights Coalition! These places are always looking for funding and volunteers, and they commit to making every day a day of love for the animals in your community and around the world. If you’ve ever wanted to do more to be kind to animals, these organizations are for you, and we welcome your big heart with open arms. 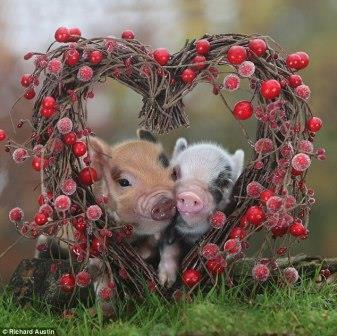 However you’re celebrating this Valentine’s Day, remember the animals!